Roella ciliata is a sun-loving, summer-flowering fynbos shrublet with large, showy flowers, but it is not yet well known in cultivation because it is quite tricky to grow. Roella ciliata is a scrambling or erect shrublet to 500 mm high, with small, stiff, hairy, needle-like leaves that end in a rigid, sharp point (pungent). The leaves have rough, whiskered margins and the midrib is thickened underneath. Branches are mostly formed from below the flowers. It has outstanding large, bell-shaped flowers borne singly at the tips of stiff branches, but often held closely together. The flowers are lilac-blue or white and are distinctively marked with navy blue to black spots or a band on the petal lobes. The dark band is often edged with white, forming a white ring on the petals. 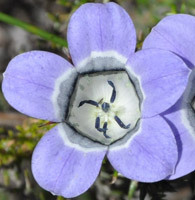 The base of the flower inside the tube is paler lilac-blue to white. It flowers in summer, from August to March. 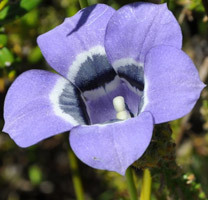 Roella ciliata is listed as Least Concern in the Red List of South African Plants, which means that this species is not threatened. Roella ciliata has fragmented (patchy) populations in the wild. It is frequent on stony slopes or sandy flats and dry sandstone slopes in the south-western Western Cape from the Elandskloof Mountains to the Caledon Swartberg, and is common on the Cape Peninsula. It grows on flats and lower mountain slopes, either on sand or among rocks in the extreme southwest. The Roella genus comprises 25 species, all endemic to South Africa and mostly in the Western Cape. Most species are restricted to the Cape Floristic Region with one species occurring along the east coast from Eastern Cape to KwaZulu-Natal. The genus Roella is named after G. Roelle, one-time professor of anatomy at the Academy in Amsterdam. The name ciliata means fringed with hairs, referring to the leaves. The family name Campanulaceae, named after the type genus Campanula, is derived from the Latin word campanula, meaning little bell because the flowers are typically bell-shaped, hence bellflower. Roella ciliata was featured in Curtis's Botanical Magazine volume 11, plate 378, published in 1797 and drawn from plant material introduced to Europe by Francis Masson in 1774. Roella ciliata is probably pollinated by monkey beetles and other insects, like bees. Monkey beetles covered with pollen are commonly seen in Roella ciliata flowers. Roella flowers are protrandrous, meaning that the male reproductive organs (the stamens) mature before the female ones (ovary, style and stigma). Before the flower opens, the pollen from its own stamens is deposited on pollen-collecting hairs on the upper part of the style. When the flower opens, the visiting insects remove the pollen from the style - at this stage the style can be seen as a straight rod dusted with pollen, with the navy blue-black stamens around it. At the next stage of development, the hairs retract and the pollen falls to the base of the flower. Then the stigma ripens and becomes receptive to pollen - at this stage you can see the top of the style unfurl into two white lobes. Since its own pollen is out of the way, the stigma is only exposed to pollen brought in by insects from other flowers, and cross-pollination is achieved. Roella ciliata can be best used in the rockery, or as a container subject, and can be also used as an edging plant. It requires acidic, well-drained soil in full sun and, once established, does not require much watering. Roella ciliata is not easily propagated, thus it is not widely used as a garden subject. Seeds can be sown in autumn; germination is slow and may take up to 3 months. 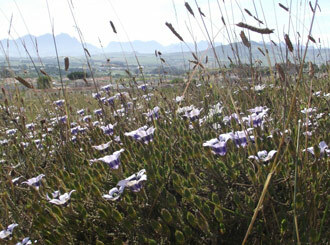 Experiments done at Silvermine Nature Reserve showed that seed germination was improved by plant-derived smoke. At Harold Porter National Botanical Garden, after fire, many seeds germinated, thus hinting that seeds require smoke treatment for high percentage of germination. The author is currently researching effective propagation methods of Roella ciliata. Adamson, R.S. 1952. A revision of the genera Prismatocarpus and Roella. Journal of South African Botany 27: 93-166. Bond, P. & Goldblatt, P. 1984. Plants of the Cape Flora. A descriptive catalogue. National Botanic Gardens of South Africa. Brown, N.A.C. & Duncan, G.D. 2006. Grow Fynbos plants. Kirstenbosch Gardening Series. South African National Biodiversity Institute, Cape Town.Clarke, H. & Mackenzie, B. 2007. Common wild flowers of Table Mountain. Struik. Cape Town. Cupido, C.N. 2010. A new species of Roella (Campanulaceae) from Western Cape, South Africa. Edinburgh Journal of Botany 67: 425- 430. Goldblatt, P. & Manning, J.C. 2000. Cape plants. A conspectus of the Cape Flora of South Africa. Strelitzia 9.Cape Town.Jackson, W.P.U. 1990. Origins and meanings of names of South African plant genera. University of Cape Town Printing Department. Trinder-Smith, T. 2006. Wild flowers of the Table Mountain National Park. South African Flower Guide 12. Botanical Society of South Africa, Cape Town.